Can you find the cosmonauts' feet? Russian cosmonauts Alexander Misurkin and Anton Shkaplerov are pictured outside of the International Space Station's Pirs docking compartment during a spacewalk on Feb. 2, 2018. Two cosmonauts took a spacewalk outside the International Space Station today (Feb. 2) to tackle a long-awaited upgrade to the communications system on the Russian side of the orbiting laboratory. They also set a new record for the longest Russian spacewalk, after spending 8 hours and 13 minutes working outside the station. Clad in their Russian Orlan spacesuits, Expedition 54 Cmdr. Alexander Misurkin and flight engineer Anton Shkaplerov opened the hatch of the Pirs airlock at 10:35 a.m. EST (1535 GMT), officially marking the start of their spacewalk. An old electronics box drifts through space after Russian cosmonauts tossed it away from the International Space Station during a spacewalk on Feb. 2, 2018. The cosmonauts spent the day replacing an electronics box for a high-gain communications antenna outside the Zvezda service module. Instead of holding on to the outdated piece of equipment, the cosmonauts tossed the original electronics box overboard, dooming it to burn up in Earth's atmosphere. The old box was idle on the station for 17 years as Russia struggled to get its new Luch satellite networks up and running in the middle of a funding crisis. When the Russian space agency Roscosmos launched the antenna and its original box in 2000, the equipment was supposed to enable communication between the ISS and a new suite of Luch satellites that had yet to be launched. But it took over a decade for Roscosmos to launch any new Luch satellites. By that time, the antenna's electronics — made in the 1990s — were obsolete and incompatible with new satellite technology. In order to work, the antenna needed updated electronics. "This will upgrade the performance telemetry and high-data-rate capability on the Russian segment of the ISS and make it similar to the data rate seen in the U.S. Ku band communications system on the U.S. segment," which uses NASA's Tracking and Data Relay Satellite System, Navias said. Removing the old electronics box was a bit of a hassle for today's spacewalkers, as the device was not meant to be serviced or replaced in orbit, Navias said. Flight controllers anticipated that the cosmonauts would have a hard time handling small bolts, cables and electrical connections, as those were not designed to be handled by spacewalkers wearing bulky EVA gloves. Instead of storing the old box somewhere on the station, as spacewalkers often do, the cosmonauts jettisoned the outdated piece of equipment. To ensure the debris wouldn't hit the ISS, they tossed it behind the station. The box weighs 60 lbs. (27 kilograms) and is about the size of a carry-on suitcase. But that box wasn't the only thing the cosmonauts intentionally dropped over the Earth; after wiping down their spacesuits in the last few minutes of the spacewalk, they also jettisoned two towels. They did this to prevent any "foreign debris" from getting inside the space station, Navias said. The jettisoned electronics box floats away from the International Space Station. It will eventually fall to Earth and burn up in the atmosphere. Their biggest obstacle took them by surprise about 7 hours into the spacewalk, when the high-gain antenna failed to deploy. Ground controllers had moved the antenna into the launch configuration — meaning it was folded up — to prepare for today's spacewalk. But when they sent the command for the antenna to unfold back into its operational configuration, it got stuck. Misurkin and Shkaplerov spent several minutes wrestling with the antenna to fix the jammed equipment. With a little elbow grease, they managed to deploy the antenna. However, it ended up deploying into the wrong position, pointing 180 degrees away from where it should have been pointing. Despite its askew position, the antenna "is operating and in good shape," Navias said. Roscosmos plans to investigate the issue to determine what, if anything, needs to be done. After fumbling around with the antenna and electronics box set them behind schedule, the cosmonauts ended up breaking the record for the longest Russian spacewalk in history. They beat the previous record by just 5 minutes. That record was set by Expedition 38 cosmonauts Oleg Kotov and Sergei Ryazanski on Dec. 27, 2013. This was the second spacewalk at the ISS this year and the 207th in all. Misurkin has now completed four spacewalks in his cosmonaut career and has accrued 28 hours and 14 minutes of total spacewalking time. 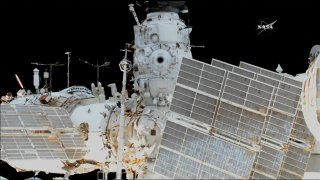 This was Shkaplerov's second spacewalk, and he has now accrued 14 hours and 28 minutes. Cosmonauts Alexander Misurkin (left) and Anton Shkaplerov are pictured in their Russian Orlan spacesuits during a fit check on Jan. 31, 2018.